Okay, you elementary teachers out there have probably heard of the Twist ‘n Write, and you’ve been using it for years. Well, I teach middle school, and I don’t always get to hear about the ‘latest and greatest.’ Furthermore, one would think that I don’t have a need for such a tool, but one would be mistaken. Now let me preface by saying that I have no idea how to address handwriting concerns – this is just not something middle school teachers are even trained in. Yet, over the years (and maybe this has something to do with technology…) I am seeing more students who can’t stay on the lines, who crunch all of their letters together, who can’t apply consistent pressure to the pen/cil, etc. So I brought my concerns to our school’s Speech Language Therapist, who then referred me to the district’s Occupational Therapist. I explained to the OT how I had one student in particular whose writing was completely illegible. I watched how he held the pencil – in a very strange way that didn’t look at all comfortable or effective. 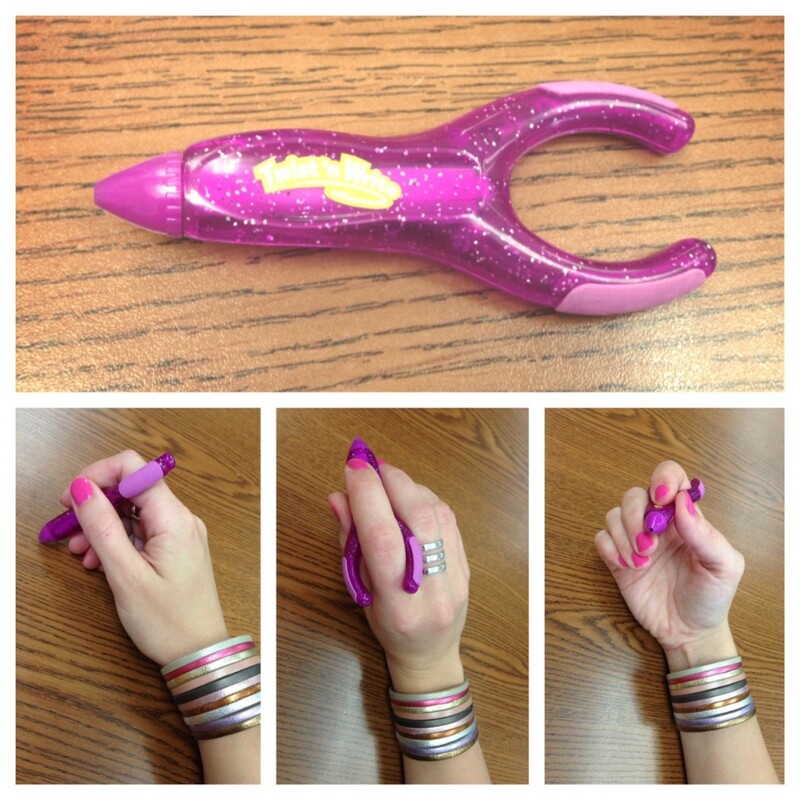 The OT recommended the Twist ‘n Write, which I lovingly call the ‘Rocket Pencil’ because of it’s shape. The Twist ‘n Write pencil is designed to help students who struggle with gripping pen/cils and, therefore, handwriting. I demonstrated to my student how to use it, and he was very excited to be able to control the pencil much more with this new grip. The Rocket Pencil forces you to grip the pencil in the correct way. His writing improved – nowhere near perfect, but definitely a major improvement. I purchased a few more, and now I keep 3 in my room at all times for students to borrow. Some try it out and find that the Rocket Pencil is the love of their life, and others find that it isn’t for them. I only wish that they were a little more affordable, and that they were refillable. 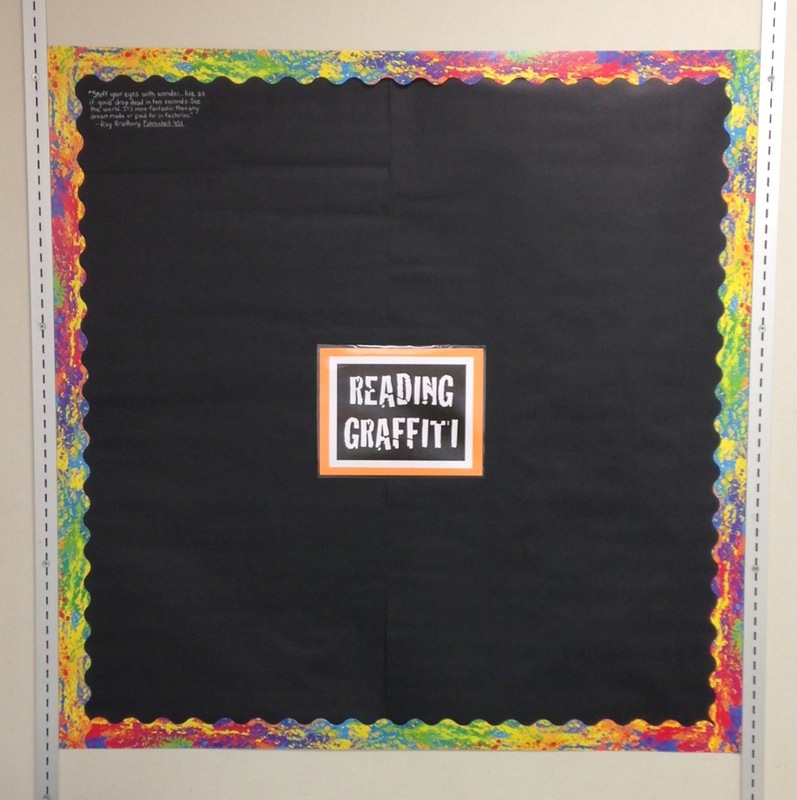 But hey – it’s worth a try, and they are a great tool to add to your classroom! Happy ‘Stomp Out Bullying Day’ – aka ‘Blue Shirt Day!’ It is a day to stand in solidarity and educate about bullying and cyberbullying. My sweet students made these awesome posters, which we hung up around the school. They also created videos, poems, and raps to share with the class. We did this during PBIS time (Positive Behavior Interventions and Supports), a time built into our school schedule for character building. 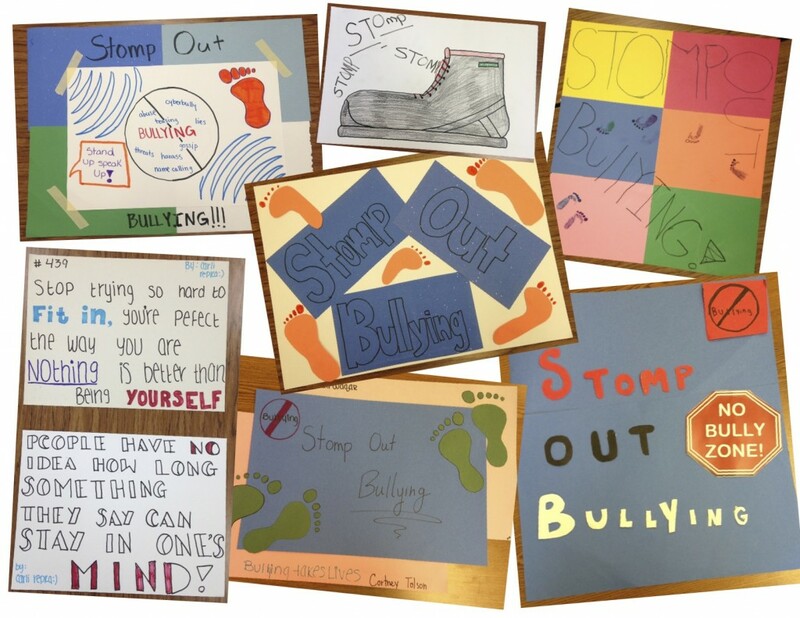 Did you celebrate ‘Stomp Out Bullying Day’ at your school? Have you heard of PBIS? It stands for Positive Behavior Intervention and Supports. It is the behavioral component of the RtI Response to Intervention system. The idea is to promote positive behaviors rather than focusing on the negative. Instead of saying “We don’t run in the hallway,” you would say “We walk in the hallway.” It may seem like a minor difference, but it is important to focus on what students CAN do, point out what they are doing RIGHT, rather than on the undesirable behaviors. Truly, 99.9% of the students in my school are extremely well behaved. I have to remember that the one kid who struggled today does not represent my whole class – I need to focus on what is going right! PBIS is important because it creates a system in which you systematically teach students what you want them to be doing. 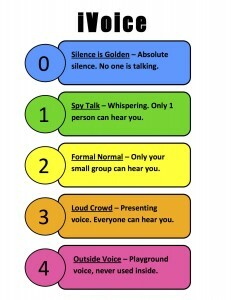 For example, I might say to my class, “Quiet down.” What if they aren’t sure what quiet sounds like in a classroom? What if no one ever explained it to them? That’s where a PBIS lesson would come in. I use the iVoice system in my classroom, and we start the year by practicing each of the voice levels so that I know and the students know exactly what is expected. You may have seen my previous post about how we start the year doing a tour of the school, discussing expectations, and practicing how to behave appropriately at each location – some kids just honestly need a demonstration. We have a PBIS time built in to our schedule. Every Wednesday, we have 30 minutes in which the whole school can focus on PBIS initiatives, including building teamwork and positive relationships and teaching (or reteaching) behavioral expectations. Character building lessons are part of this time, such as a lesson on Fairness and Trustworthiness. 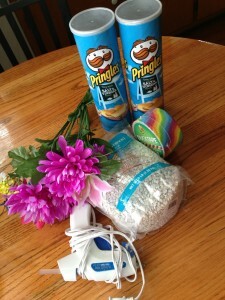 We also discuss the future quite a lot – goal setting and dream planning time. 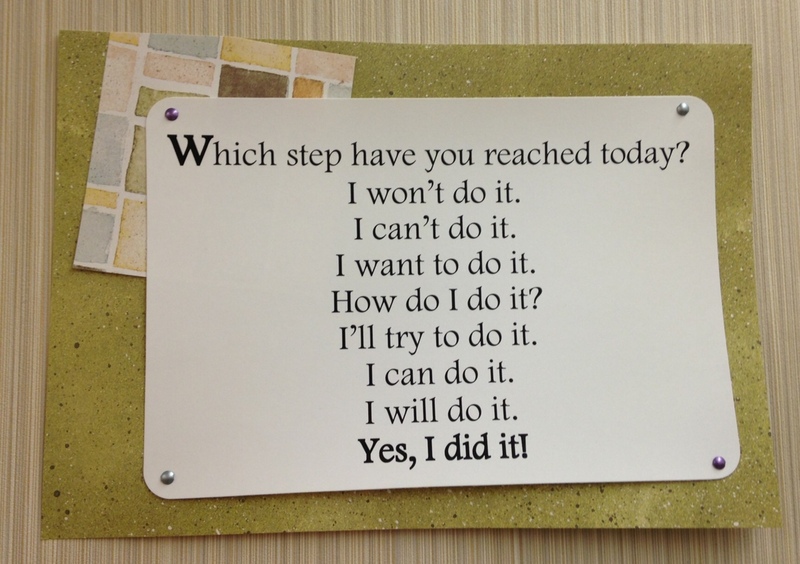 I love that we do this – it has a really big impact on so many students. An integral part of our PBIS system at our school is the use of blue slips and yellow slips (our school colors). 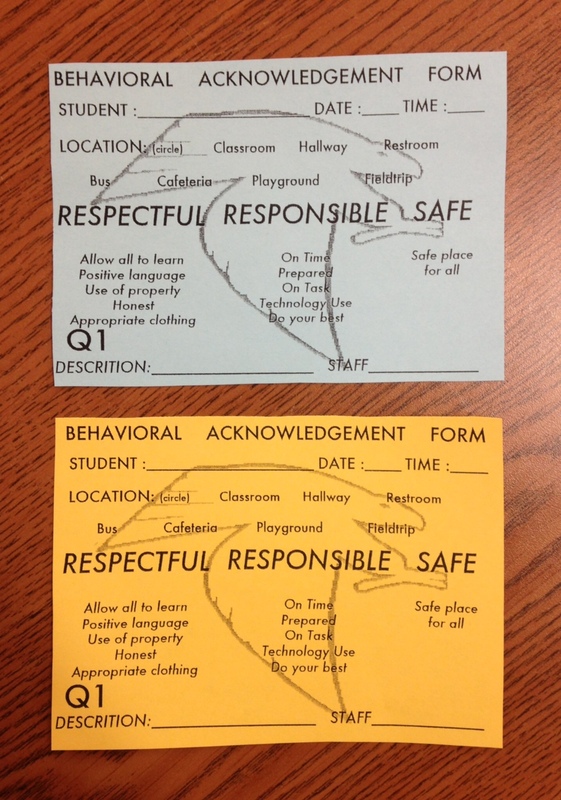 The text on the slips is exactly the same – it shows our PBIS motto (Be Respectful, Responsible, and Safe), and lists the expected behaviors. The blue slips are the positive slips – we give them to students when we celebrate them doing something positive. The yellow slips (think ‘caution!’) are a behavioral modification slip – we give them to students who need to make a better choice. 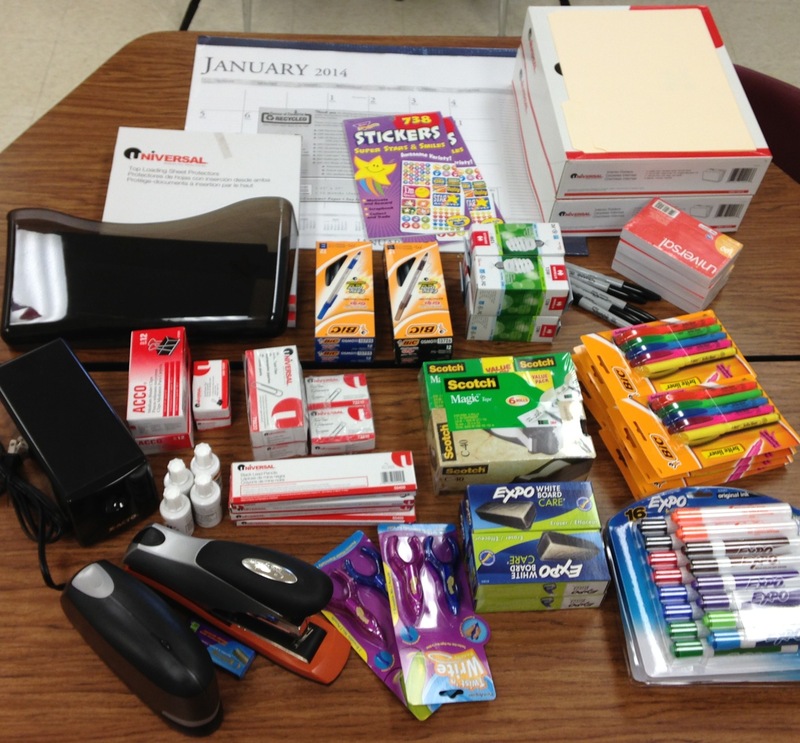 Students can save up the blue slips and buy fun things from our school store, from erasers and candy to backpacks and gift cards. The yellow slips, on the other hand, go to the office and get recorded. If a student builds up 3 within 10 days, it becomes an after school detention. Students hate getting this, and sometimes all you have to do is mention the yellow slip or place it on the desk as a warning, and the behavior will get corrected right away. The office uses the information on the yellow slips to help target areas needing more attention and intervention in our school. Perhaps there is a trend of poor behavior in the hallways – we use PBIS time to reteach our expectations, watch a fun youtube video, or anything else to help communicate our message of being Respectful, Responsible, and Safe for the good of our school. I know PBIS has a huge impact on students’ academic behaviors as well. Any good teacher knows that students can’t learn in an environment that isn’t respectful, responsible, or safe. When students buy into the system, they are more comfortable with the procedures and expectations of our school, and the students thrive on that comfort and safety. So my goal is to give out 5 blue slips (positive) for every 1 yellow slip (negative). And if I give out a yellow slip – let’s say to Johnny for being disruptive in class – I make it my goal over the next few days after that to notice him behaving appropriately and reward him immediately to help get him back on track. Signing blue slips got a little tedious, so I just purchased a self-inking signature stamp. Can I just say I am really excited for it to arrive?!?! I can’t wait to post a picture! 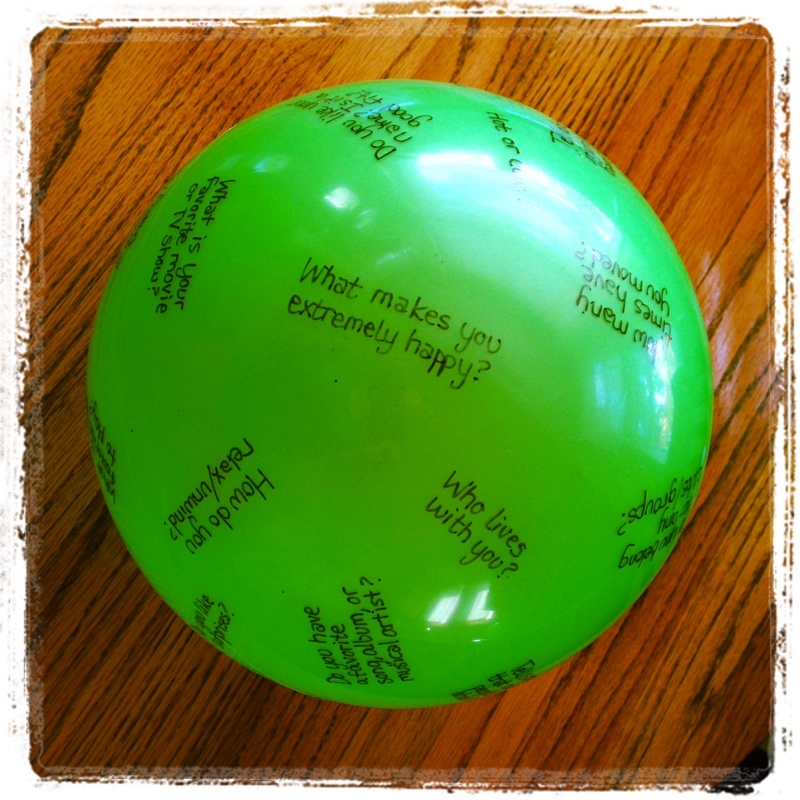 Do you use PBIS in your school? I’d love to hear about your system – we are always looking for ways to streamline and improve things. Please share in the comments! In our 2-story school, we have 4 minute passing time. Students have complained about this from the dawn of time, but it is what it is. My room is about 80 yards from the nearest restroom (it takes me about 4 minutes to walk there, use the restroom, and walk back. I’m sometimes late to my own classes, ack!). Therefore, I am a bit more lenient/understanding of students who are tiny bit late because they had to use the restroom. What I prefer, however, is that they come to my room first, drop off their belongings, and then go. Since we are going to have iPads this year, that is going to be a mandatory procedure because federal law and school rules mandate that no iPads are allowed in the restrooms. So that students don’t have to hunt me down or interrupt a conversation during passing time to ask permission to use the bathroom, I put together these Seat Markers. 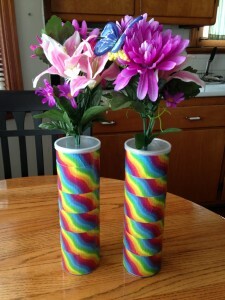 A student can simply grab one from the side table, put it at their seat, and then off they go. When class starts and I am doing attendance, I will notice the visual cue at their desk that they are in the restroom. 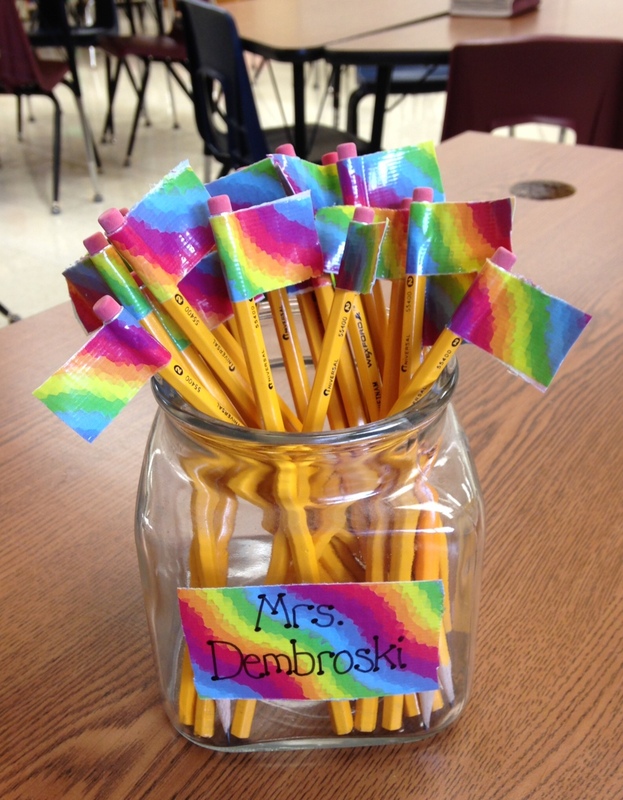 I may even branch out this year and allow my students to grab a seat marker and excuse themselves to use the bathroom without interrupting the lesson to ask permission – we’ll have to take that on a class-by-class basis depending on behavior. The final product isn’t the most aesthetically pleasing thing I’ve ever made, but I know it will do the job. 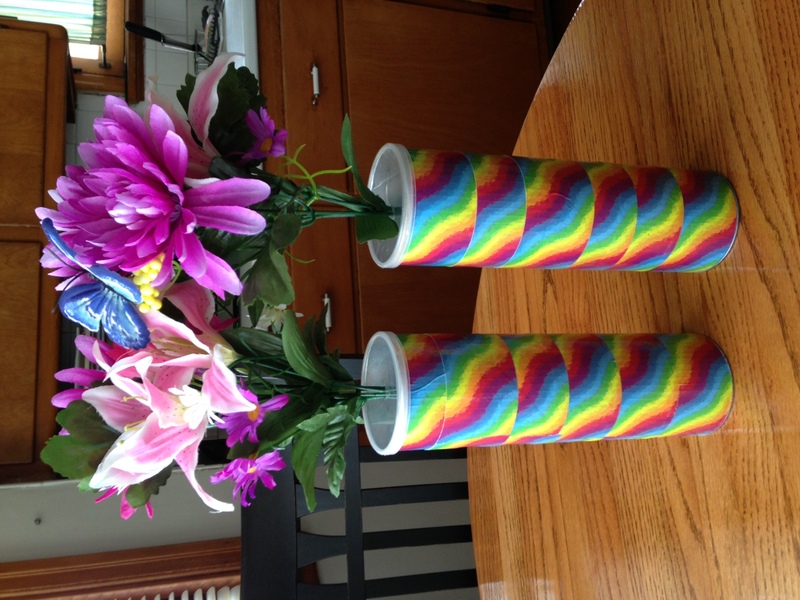 I wrapped strips of duct tape around the can, filled it with small rocks to give it weight, poked a hole in the cover to insert the flowers, then hot-glued it all shut so they couldn’t open it. Well this weekend, I just felt like drawing. I love to draw. So I sat down and started drawing zoo animals. (I really desperately can’t wait to have my own kids so I can decorate their nursery!) Well after a while, I had a pretty great collection going! I made 25 total. 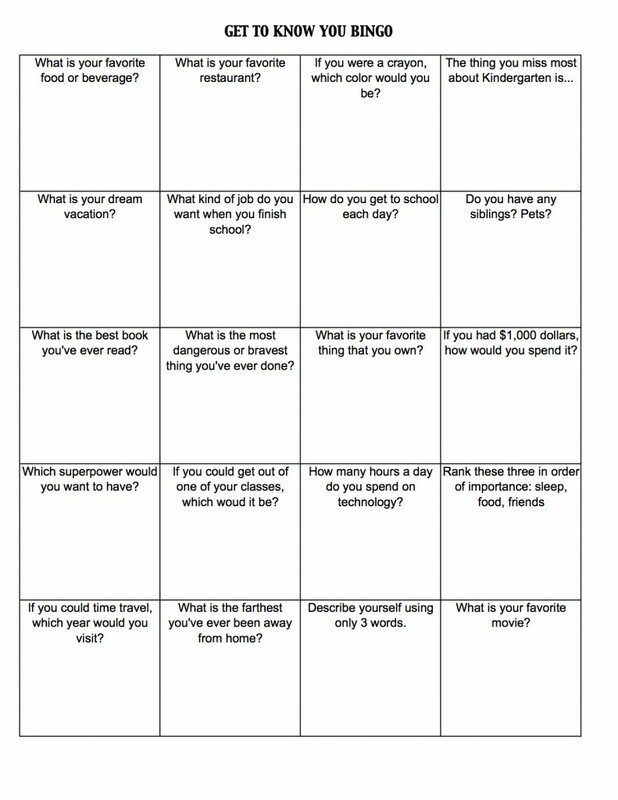 Here are some samples, and some ideas of how I would use this in an elementary classroom, if I had one. 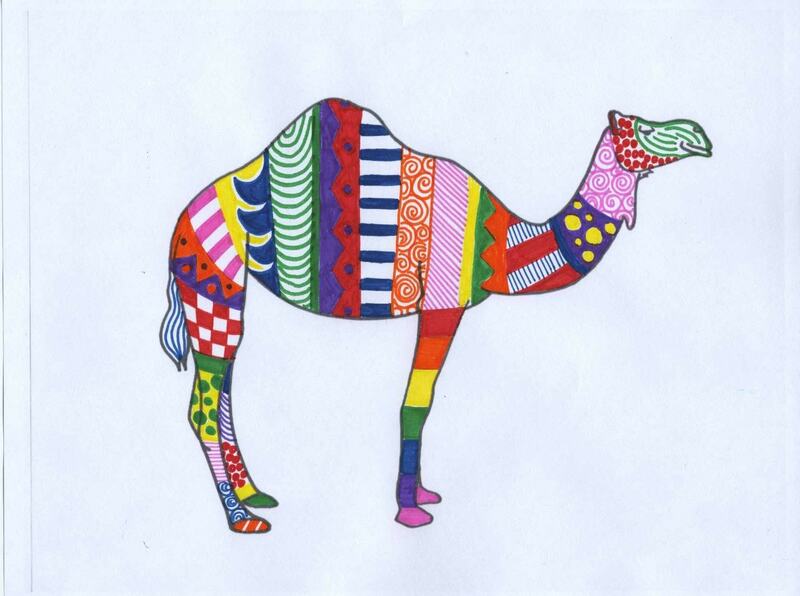 These would be some really fun activities to do before a field trip to the zoo! 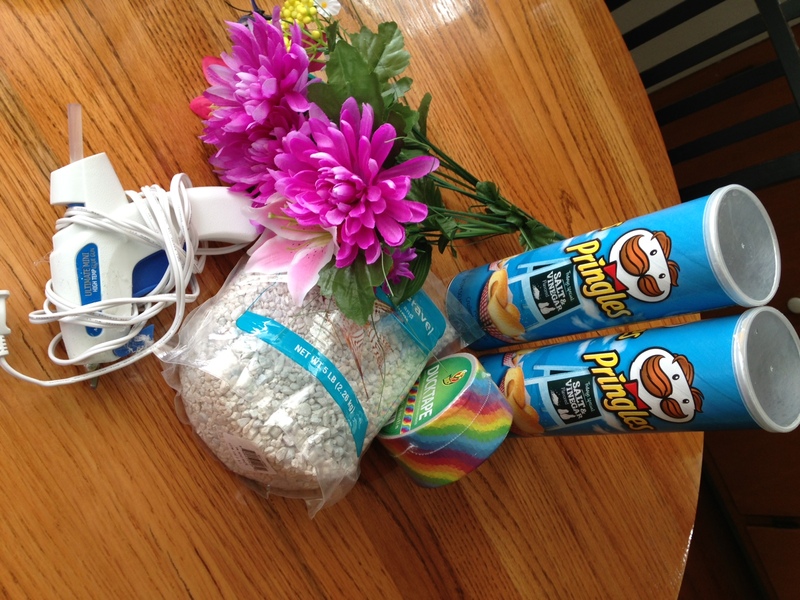 In Art, explore different art materials to create texture and shading. Or, create a cool graphic design! In Science, label the parts of the animal. Draw the animals habitat. Write details in or around the animal about the lifestyle and eating habits. 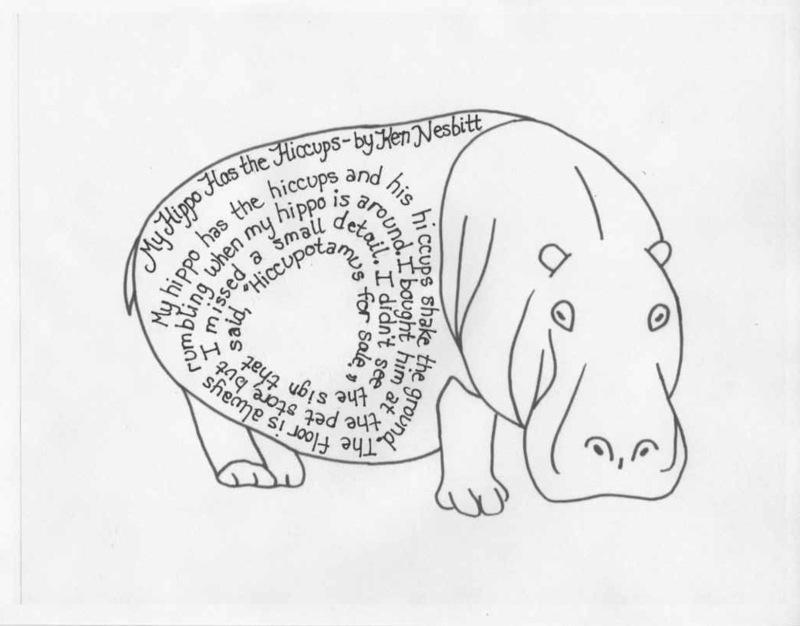 In Language Arts, write a story or poem inside or around the animal. Use the animal as an illustration in your own book. 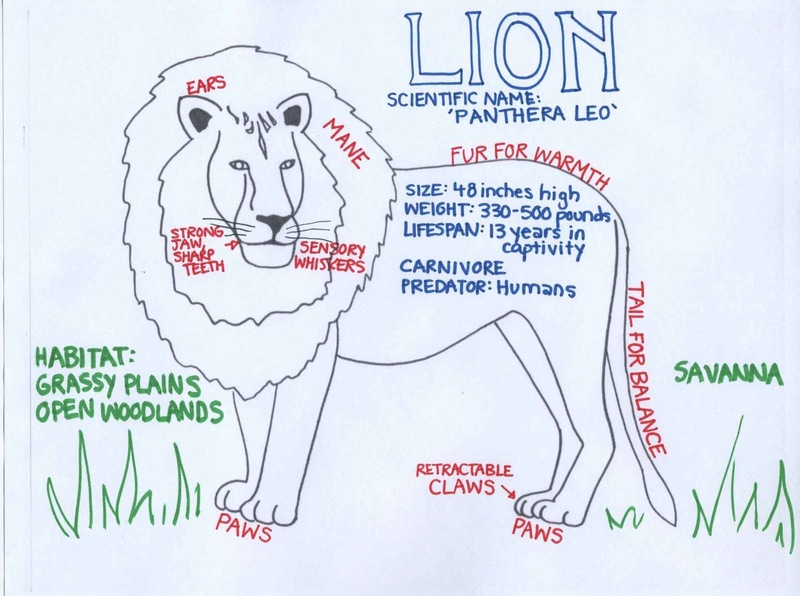 Do a research project on the animal and use the printable as a note-taking sheet. For Math, take a poll to see which animal is the class favorite. Use the animal printouts to make a giant bar graph. Use multiple printouts to represent proportions and ratios (ex. 1 lion to ever 5 elephants). For Social Studies, research the current topics around an animal. Is it frequently in the news? Being used to help society in some way? Endangered? Create a large mural with several habitats, and allow students to place each animal correctly. 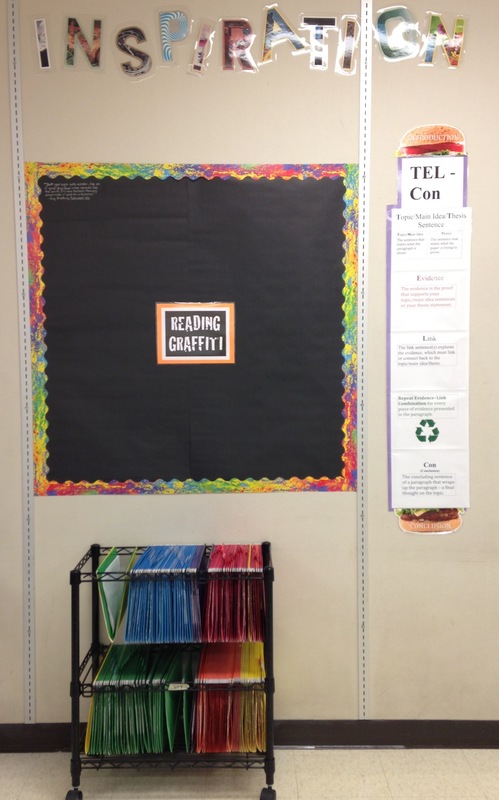 In Foreign Language, use the printables as posters with the target words (ex: name of animal). For your classroom, determine each student’s favorite animal, write his/her name on the animal, and place it on the desk as a name plate. There are TONS of ideas! I’d love to hear your ideas in the comments section. 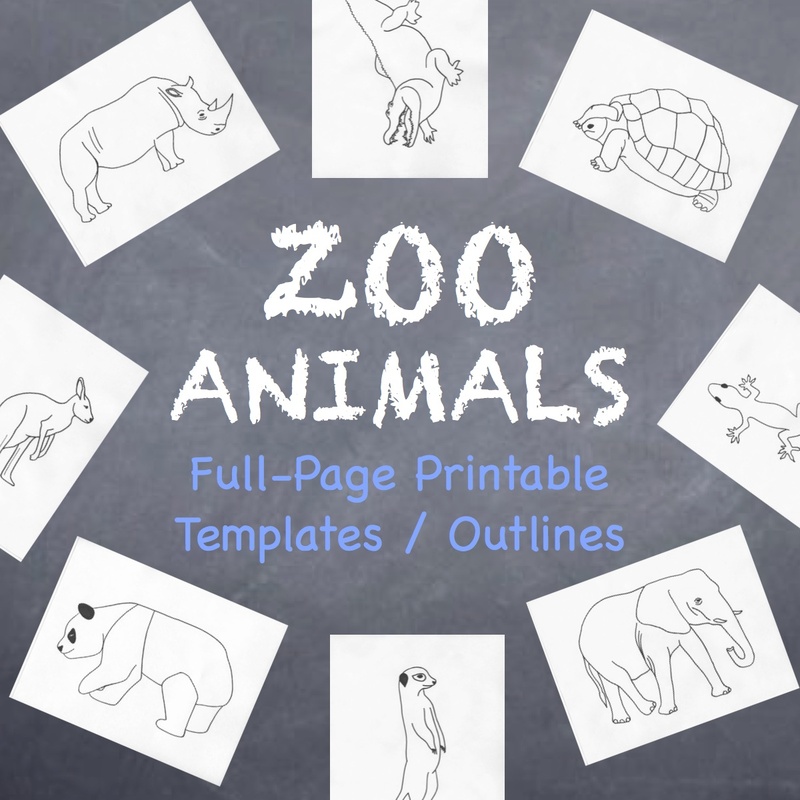 If you’d like to download the Zoo Animals printable templates, click here! Thanks, and Happy Teaching!